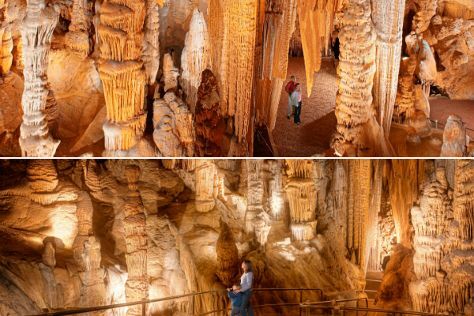 Nestled in the heart of the valley formed by the Shenandoah River, Luray draws visitors with a vast underground cavern system adorned with stalactites, stalagmites, and mirrored pools. Although the city offers few urban tourist attractions, it provides a convenient base for any adventure-seeker eager to take advantage of the area's many outdoor activities including fishing, hiking, biking, kayaking, and bird watching. In fact, the town uses the moniker "Cabin Capital of Virginia" because of the accommodations in the region. Just 140 km (90 mi) from the country's capital city, the town of about 5,000 also serves as a gateway to the state's national park, which encompasses a large part of the Blue Ridge Mountains. Luray is in Virginia (VA). Our United States trip itinerary planning site combines visitor reviews with your personal interests to make an itinerary informed by experts, but tailored to suit your style.